In the cloud, change is frequent, automated and impactful. What options do you have for maintaining visibility, security and control? In this three part series, I will take you through Amazon Web Services (AWS) Config – how to adapt the service to your needs, the key concepts, timelines, Config rules and partner integration. I will discuss the overall scope for its ability to be used not only for security analysis and audit compliance but for change management and troubleshooting capabilities. AWS Config – a lesser known service from AWS, acts as a ‘VCR’. It records everything changed in AWS and normalises them into a common format known as a Configuration Item. This data is stored in Amazon S3 (Amazon Simple Storage Service) and builds an SNS (Simple Notification Service) Configuration Stream. It means that you have visibility every time a configuration item changes. This is very powerful. All of this information is available in a dashboard so you can visualise and ultimately review for compliance, identifying offending and unauthorised changes. 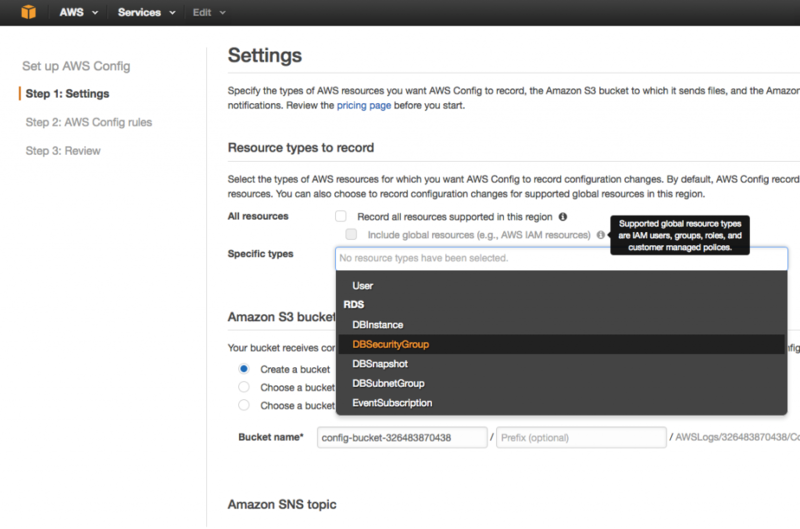 By default, AWS Config records everything to S3. However, if you are not interested in everything, you can be more selective. You can choose not to record changes made to instances and only changes made to things you specifically care about such as Security Groups, for example. You can select an S3 bucket of your choice. This can even be done in another account if you are looking to consolidate the configuration information from multiple AWS accounts (even in different regions) into a centralised account. If you do this, be aware that the S3 Bucket Policy must allow you to do this. The service requires Identity-based (IAM) permissions in order to read your data (read-only is required). The service integrates with Amazon SNS allowing you to stream the changes to an existing or new SNS Topic. If you are considering a multi-region deployment then best practice is to create an SNS Topic in each region, aggregating them to a common SQS (Simple Queue Service) queue in your home region. In part two of this post, I will further explore AWS Config through the key concepts of the service, the AWS Config timeline (my favourite part of this tool) and the Config rules for building up the base capability of recording all changes.